Fans of indoor plants love this ornamental plant with the original leaves. Due to its clinging to the supports of the shoots, ivy good as for the decoration of residential premises, and the greening of facades of country houses. Fans appreciate this plant for its simplicity and rather easy growing conditions. Most often, ivy is grown in natural conditions, like a vine. Its strong stems have many aerial roots. 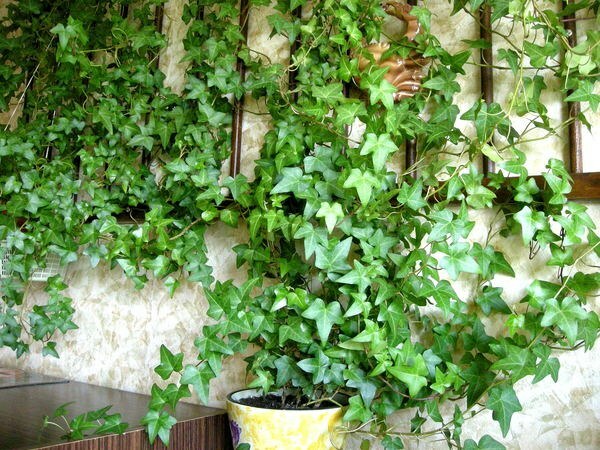 Due to them the ivy "climbs" the wall of the house or apartment. Start to grow home decorative ivyI. Undemanding to content variety, having leaves oval and round shape. Interest is ivy with leaves in the form of stars. Beautiful plant with crimped edges of the leaves. The color of the ivyand the leaves can be green, yellow, covered with spots. This plant is not capricious. Ivy feels good in rooms that are not very well heated. Only one condition – the temperature should not fall below 12 degrees. Ivy is a plant which likes constant spraying . Varieties of ivyand having brightly colored leaves, like bright light. But the lack of direct lighting does not prevent the ivyfrom well developed. In the winter, when daylight is very short, can be used for additional lighting of plants phyto - lamp. Ivy likes moist substrate. In the summer, when the soil is often dry, should be well watered plant. Water should not stagnate in the pot, as the roots can rot. From time to time to give the plant a warm shower, carefully washing it leaves. Ivy prefers a light soil consisting of a mixture of peat and humus. Formula: 1 part sod, 1 part humus soil to 1 part sand. Ivy grows fast and therefore needs periodic fertilizing with various fertilizers. In the beginning of spring and during the summer the plant should be fed a special fertilizer for plants with decorative leaves. Regular fertilizing once in two weeks. For proper formation of the stems and to give the plant a fluffy ivy, or rather, the tips of the shoots, pinch out. Every two years the plant should be transplanted into a larger pot. For reproduction using cuttings of ivy, well rooted in the soil after pre-treatment with a stimulator for the roots. With good care and optimum conditions for the growth of the ivy is very rarely affected by pests. For cultivation in the conditions of the room used varieties of ivy with small leaves. For landscape design to choose species with large leaves, and leaves that changes color depending on the season.